NYC's Garment District has seen a rapid reinvention over the past few years, which comes as great news to the folks who pour through the area to report to their office jobs, set out on shopping sprees at Macy's, catch concerts at Madison Square Garden, go sightseeing at the Empire State Building, or do their commuting at Penn Station. Several new stylish hotels have cropped up over the last few years, offering tourists decent digs, as well as worth-sticking-around for dining-and-drinking venues. 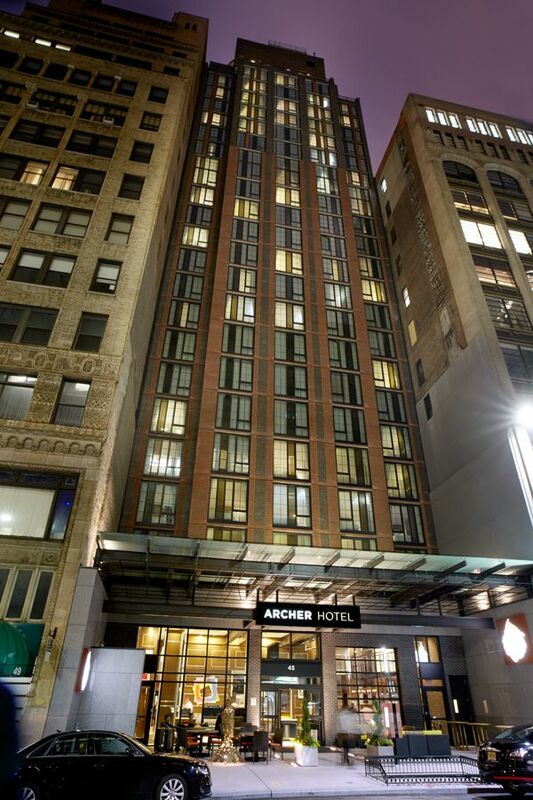 Archer Hotel New York is one of the latest in the recent years' wave, offering sophisticated hotel rooms, the Charlie Palmer Steak restaurant, and a 22-story-high rooftop bar. Here's what to expect. The 180-room Archer Hotel comes with plenty of personality, including an industrial-chic design of brick, glass, and steel that nods to the historic neighborhood's locale, and a hotel staff that makes it their mission to ensure guests have a memorable stay. And that they will. Guests can expect thoughtful touches like bottled water and salted caramel candies upon arrival, a curated art collection, and a rotation of nightly turndown treats from local establishments. Snug guest rooms come in four design palettes, each changing out color accents along with drapery, headboards, throw pillows and blankets, and artwork. Many room features have been locally sourced, including light fixtures manufactured in Brooklyn, millwork from Queens, and custom furnishings from nearby Westchester. Units come with tech-friendly extras like complimentary Wi-Fi, 42-inch flat screens, and device docks. In the bathroom, look for plush Frette bathrobes and Malin+Goetz bath amenities, while a Nespresso machine and stocked minibar round out the offerings. While all rooms come with floor-to-ceiling windows, it's well worth the splurge to upgrade to a room on a top floor touting stellar Empire State Building views. The menu at the Charlie Palmer Steak restaurant changes with the seasons, always offering options inspired by and made from the region's local flavors and ingredients, so everything is served fresh. Open for breakfast and brunch, lunch, and dinner, the restaurant also offers a prix fixe, three-course, pre-theater menu and a patio menu with a selection of light bites and happy hour beverages. Menu highlights to consider include the Tuna Tartare starter ($19), the Surf and Turf, which gets you an 8-ounce petit filet and a Ritz-cracker-, onion-stuffed lobster tail ($56), and the creme brulée ($12) or S'mores cake ($16) for dessert. The master behind the menu, chef Charlie Palmer, draws inspiration and expertise for his dishes from his upbringing on a New York farm, his education from the Culinary Institute of America, and his experience working in several kitchens across France and the United States. The rooftop space, Spyglass, is an intimate affair that can host around 100 patrons. Pair signature cocktails with sweeping views of the Empire State Building and out across NYC's iconic rooftop water towers, from its 22nd-floor perch. Swill mixologist-prepped cocktails (from $17‒$19) like the Purple Rain (a blend of Bulleit bourbon, blackberry, ginger, and lime) or the Lotus Flower (hibiscus tequila, lemon, and agave), and pair them with light bites, sourced from downstairs eatery, Charlie Palmer Steak. Beers are $9, or order up wine by the glass from $16. Just be forewarned, should the views sweep you off your feet: It's standing room only outside, so you'll need to head to the indoors area in order to nab a stool at the bar. Spyglass is a summer happy hour hot spot for Midtown after-work crowds.